The gambling in 2006 is over. It is always about risking the weather. Do you risk everything and wait, hoping to make a superior wine? Or do you risk nothing and gain nothing special in return? In some vineyards this was the case scenario in 2006 as extended growing seasons in some areas of California were complicated by late-season rains. Maybe you pick before, maybe you pick after, or maybe you do both. Pinot Noir and Chardonnay are thin-skinned varieties and particularly susceptible to outbreaks of botrytis after rain and this necessitated extra time in the vineyard to prevent bunch rot. The scenario was quite different for every microclimate in California, and Bouchaine’s Michael Richmond said that” the harvest will vary from vineyard to vineyard.” Fortunately, most growers of Pinot Noir are now so adept at farming the finicky grape that practically any weather problem can be suitably dealt with. Overall, 2006 was an excellent harvest for Pinot Noir throughout the world with some exceptions. A number of general impressions of the Pinot Noir harvest in 2006 follow. The California Association of Winegrape Growers reported that the 2006 California crush will be about 2.65 million tons of wine and grape concentrate compared to 2.5 million tons in 2005. Botrytis was more prevalent than any vintage in recent memory. According to Michael Richmond of Bouchaine Vineyards in Carneros (www.sfgate.com, 10/14/2006), there is no nobility in this rot for Pinot Noir. If the fungus, Botrytis cinerea, affects a cluster of red wine grapes, the grapes must be discarded because they will produce wine with poor color extraction and undesirable flavors. Richmond described the taste as “rancid tea leaf.” The fungus (pictured right) has a whitish-greenish color on Pinot Noir and can easily take over the entire cluster. It actually looks pretty on Chardonnay, kind of a pink color, and can even add interest to Chardonnay’s flavors in small amounts. To protect grapes from water damage and botrytis, extra time must be spent in the vineyard removing leaves to allow sun and wind to keep the fruit as dry as possible. Ed Kurtzman of Freeman Cellars told me that at Keefer’s Vineyard in the Russian River Valley, they went through the vineyard prior to harvest and turned all of the clusters around (the fungus hides on the shady side of clusters) so pickers could see affected bunches. Any botrytized grapes that are picked must be removed on the sorting table. In some areas of the Central Coast, the crop was reduced by 50% due to cold and rain during spring flowering. In the Santa Maria Valley, Pinot Noir tonnage was off by 75% in some vineyards. Overall, production in the Central Coast will be off about 10-20% compared to last year. From Santa Barbara north to Monterey, the growing season was extended by spring rains and a few late storms delayed ripening and caused botrytis (bunch rot). Quality was good for vineyards that avoided the bunch (noble) rot, others had to pick around it. The Paso Robles Templeton Gap area, an emerging Pinot Noir region, had a long growing season in 2006. Some rain in mid-October did cause some bunch rot, but quality overall was outstanding. The sugars tended to be a little lower than 2005. According to Jonathan Pey, owner and winegrower of Pey-Marin Vineyards, heavy winter rains and a cold spring were followed by a breezy summer with plenty of sun and cool nights. The county’s vineyards were spared from botrytis, presumably because Marin’s warmer winters accelerate bud break and this was followed by a very long, cool and dry growing season. Harvest officially began on September 16, with grapes from Mark Pasternak’s Devil Gulch Vineyard going to Schramsberg for sparkling wine. The majority of the harvest took place between October 6 and 30 under sunny conditions. Yields averaged 1.3 tons for Pinot Noir and quality of the grapes was superb. Mark was ecstatic and said that he had a record harvest in 2006, with Pinot Noir tonnage exceeding the total for the last three vintages (he had no grapes in 2005). Devil’s Gulch Vineyard pictured right. Marin has become famous for it’s flavor-packed “microberries.” Many growers feel that “size matters,” that is, smaller grapes deliver more concentrated flavors. Jonathan shared with me a study he did at this harvest which showed the typical small Pinot Noir clusters so prevalent in Marin. He compared 15 clusters of Pinot Noir grapes from the Santa Lucia Highlands (SLH), Anderson Valley (AV), and Marin County (MC). The clones were Pommard for SLH and AV and 115 for MC. Brix was 26.2 for SLH, 25.9 for MC, and 25.2 for AV. Average cluster sizes were: SLH - length 4 inches, weight 144 g; MC - length 3.25 inches, weight 68 g; AV - length 4 inches, weight 184 g.
It was a particularly cool growing season in the Santa Cruz Mountains and light rains in mid October caused some consternation. Most growers, however, brought their grapes in before the rains came. Some vineyards had grapes with low sugar and high acidity but overall, winemakers were pleased with the quality and ideal sugar/flavor balance. Yields were larger than last year. 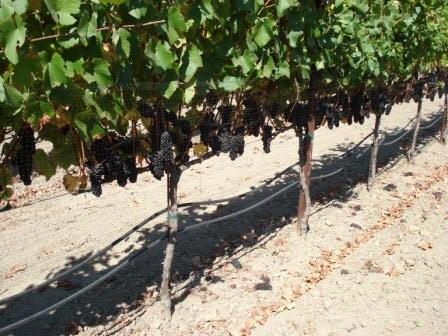 Jim Schultze, winegrower at Windy Oaks Vineyard and Winery in Corralitos, found harvest delayed nearly two to three weeks compared to the previous year. Punch downs at Burrell School Vineyards and Winery below. Jamie Kutch, owner and winemaker of Kutch Wines, experienced his second vintage in Sonoma, and offered some interesting insight into the vintage. 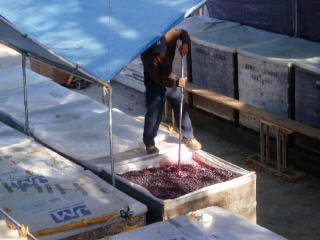 He said that many winemakers had seen a fair share of what’s called sour berry or water berry in 2006. Sour berry refers to clusters of fruit that are translucent and taste very sour. Some believe it results when temperatures exceed 100 degrees (as in July of this year). The heat shuts down clusters permanently and the grapes never ripen. The grapes do not achieve normal color and hang plump loaded with water and with low sugars making them sour. Jamie believes 2006 will be a fantastic vintage for those who prefer their Pinots with structure and high acidity. With a string of cool nights during the growing season, the acid levels are exceptionally high. Botrytis was an issue in some vineyards where leaves were not pulled sufficiently to open the canopy. Some savvy farmers pulled leaves early in the season and sprayed to avoid bunch rot. 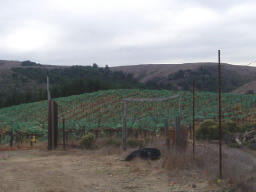 Jamie sent some photos from the Oneel Vineyard in the Russian River Valley. He harvested the fruit here on the last day of September. 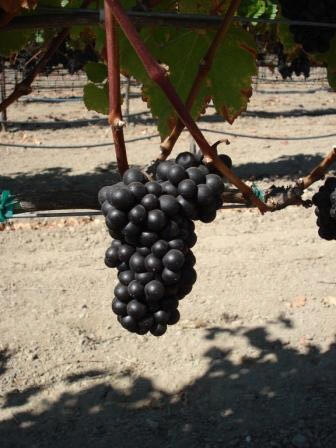 What is notable is that the color of the fruit is nearly black (but isn’t why they call it Pinot Noir?). The Pinot Noir crop was moderately large after two very difficult vintages with lower than normal yields. There was good balance at lower sugar levels and the grapes from the Anderson Valley are priced at record levels. Alcohol levels should be more moderate. Like elsewhere in California, there were winter rains and a long, hot summer, but for those who pruned early, ripening came on schedule. 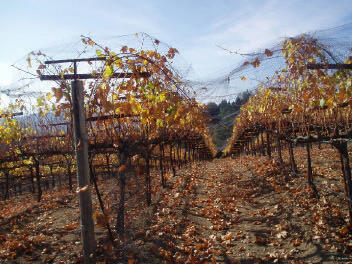 Mary Elke of Elke Vineyards reported that the last of her crop came in October 1. Grape quality is superior to 2005. No botrytis concern here, only flocks of starlings and wild turkeys with their eyes on ripe grapes. Besides a nasty frost that affected some areas of the Willamette Valley in April, the growing season went smoothly with a long, warm summer and a mild start to fall. The vintage will certainly top last year’s crop by at least 25%. Crop loads were good and various vineyards saw yields of 1.8 to 3 tons. According to Harry Peterson-Nedry, winemaker for Chehalem Wines, later harvested sites that were not damaged by the six days of heat during the final ripening stages were equal to the best he has seen in 22 vintages. Dan Cardwell, owner of Cardwell Cellars in the southern Willamette Valley, was ecstatic about the gorgeous weather. His main problem was wild turkeys. He said that a band of wild turkeys shows up on his doorstep just when Thanksgiving was around the corner. They are nasty critters with filthy feet and personal hygiene which leaves a lot to be desired. Unfortunately, Dan went out and bought shells for his shotgun, but the shells were the wrong size and became stuck in the mechanism. Someone above is looking out for those birds. Frenchman, Laurent Montelieu, formerly of WillaKenzie and now winemaker for Evergreen Vineyards in McMinnville, Oregon, used a mechanical harvester for this year’s grape harvest. The harvester picked clean 3.5 tons of grapes in 20 minutes. With the rising scarcity of immigrant workers, new state-of-the-art French harvesters may become a handy helper at harvest time. In South Australia’s wine-growing regions, drought, dry, cold winds, and black frosts have caused a reduction in the grape crop of at least 25% and $100 million in losses for the 2007 vintage. Some growers lost their entire crop. David Lloyd, owner and winemaker at Eldridge Estate in Red Hill, Victoria, had his Shiraz vineyard of 7 acres completely wiped out. Some farmers were using helicopters at great expense to fly over the vineyards, trying to push down pockets of warm air. Others were spraying a silicon product onto the vines for protection. The Mornington Peninsula region of Victoria, which is producing world-class Pinot Noir, lost about 14 acres, according to David, but he notes that the Pinot Noir production from Victoria in 2007 will probably be about 50% of what it was in 2006. The smaller crop will decrease the grape glut in Australia (currently at 800-million quartssurplus). The stricken vines will also produce a small crop in 2008. Fortunately, the Australian government offers a drought aid package to affected growers. The 2006 vintage was of expected size and very high quality. Grape production was 185,000 tons, up 11% from 2005. According to New Zealand Winegrowers, exports of wine are growing rapidly and are expected to exceed $1 billion dollars by 2010. In October, 2006, threats of frost throughout the winegrowing regions of the South Island, from Taupe in the north to Queensland in the south, brought out fleets of helicopters to force warm air onto the vines and prevent frost burn. The official start of the 2006 Burgundy harvest was proclaimed on Monday, September 18. By the time rains came over the weekend of September 30-October 1, the harvest was finished. All reports are that the grapes are excellent in quality, with plenty of fruit, good sugar levels, and enough acidity for proper structure. In the Cote de Beaune, there were some vineyards affected by the onset of rot, but the best growers escaped difficulty. For a full report on the 2006 harvest in Burgundy, go to The Burgundy Report (www.burgundy-report.com). According to that excellent website, ”the Cote de Beaune reds were closer to 2004 than 2005 quality and the Cote de Nuits grapes (on average) were slightly below 2005 quality, but in some places higher. It was a mix of hot and cold during the year so this will hopefully provide a full spectrum of flavors.” I found it interesting that more Crémant de Bourgogne, Burgundy’s sparkling AC wine, is finding its way to the United States, with total exports rising 22% in volume from January to June in 2006. Another informative source of insight on the Burgundy harvest 2006 is the wine blog at www.chezpim.typepad.com. The vineyard landscape at harvest has changed dramatically the past few years with the widespread use of over-the-row and side netting to stave off voracious birds, especially starlings. Although effective, the nets are a pain to put on, take off, and store. Several other tactics have been used to deter birds, from foraging grapes. Noisy gas guns, high-frequency devices, stereo systems played at top decibels, and diversionary food such as watermelons have been employed. But the best solution may turn out to also be a bird. History tells us that Eugene Schieffelin released several pairs of European starlings in New York City’s Central Park in 1890. The birds thrived in the United States and today they fly in large flocks with an estimated total population of over 140 million. They love to feast on ripe grapes and a flock can literally wipe out a vineyard in a day. Raptors such as falcons can be brought into vineyards by trainers to deter other birds. Currently, falcons are used primarily for airport protection. According to a recent article in www.sfgate.com, E. & J. Gallo Winery has used falcons to protect its grapes for several years. Huntington Winery (which displays a falcon on its label) brought in three falcons every day for three weeks this vintage. They patrolled Bill Leigon’s vineyard in Healdsburg and successfully deterred any birds looking to feast there. The cost was $12,000. I can vouch for the falcon’s abilities, for my wife loves to put out food in our yard for doves, blue jays, and other small birds. A few year’s ago, a wild falcon (or hawk, I am not sure), started swooping by twice a day and has picked off quite a few birds while they are dining. The raptors are magnificent hunters. A recent report by Australian scientists indicates that brassinosteroids, a group of steroidal plant hormones involved in normal grape plant growth, control ripening in grapes. The levels of the brassinosteroid, castasterone (derived from horse chestnuts), increased 13 times in Cabernet grapes once ripening began. The brassinosteroids control the expression of a large number of genes. At veraison, they turn off genes controlling photosynthesis in the grapes and turn on genes associated with flavor and sugar levels. Other hormones and ethylene may be involved in ripening fruit as well. The researchers showed that brassinosteroids can be used to manipulate ripening as well. They applied small amounts of synthetic brassinosteroids to the skin of some grapes prior to ripening and treated others with brassinazole, a chemical that inhibits the synthesis of brassinosteroids. Brassinosteroid application caused veraison to speed up, while brassinazole delayed it. The practical application of this finding is that in cool climates, ripening may be hastened. At present brassinosteroids are too expensive to spray grapes, but it would work and is safe. Plant breeders may be able to use this information to select grapes with certain attributes that allow earlier ripening. Table grape growers are using plant hormones already to influence maturation of grapes. There are some Pinot Noir producers who have forsaken the wine country for a more practical winery setup in the city. Lost Canyon Winery has been profiled in these pages several times. Their state-ofthe- art winery and modern tasting room are located in an old warehouse on the Oakland urban waterfront. The three partner-owners live close by and can easily go to the winery on a daily basis. Eno Wines and Harrington Wines both craft tiny lots of Pinot Noir in an ivy-covered warehouse in Berkeley which has been a winery since the 1970s. These three wineries are part of an urban winery movement in the San Francisco Bay Area. There are at least 14 wineries, including those such as Dain at Crushpad across the Bay in San Francisco. There is now an East Bay Vintners Alliance as well. Eno Wines is a boutique winery owned by Sasha Verhage who is also the winemaker. He is a multitalented wine lover who has been crafting wine since 1999. He learned under Tom Leaf, formerly of Grapeleaf Cellars in Berkeley, and has traveled extensively to many wine-producing areas of the world for experience. His inspiration, like many winemakers, is the combination of love for fine wine and the fine arts. He is a also a graphic designer of great repute and his uniquely designed labels (see below) have won design awards. Verhage sources his Pinot Noir from Fairview Road Ranch in the Santa Lucia Highlands and has made Fairview Pinot Noir since its first harvest in 2003. This young vineyard continues to get better with each vintage. The 2003 Eno Pinot Noir was named “The Great Promise” because after tasting the 2004 vintage, Verhage tasted a big leap in quality. The vineyard is farmed by Kirk Williams. (To see the exact location of the vineyard, go to the Santa Lucia Highlands Appellation website to view the 3-D map of all of the Santa Lucia Highlands vineyards). 14.1% alc., $30. · The nose is all wood with only a hint of prune-like fruit. The wine delivers healthy and appealing fruit flavors but is out of balance with high acid and a dry, tannic finish. The wine above, as I am sure Verhage would admit, is a quantum leap above this one. Eno Wines is located at 805 Camelia St, Berkeley. Wines may be ordered by phone (425-515-7227) or on the website (www.enowines.com). There is limited retail distribution. The website is very informative, with a number of helpful links, and not surprisingly, well designed. There has been considerable controversial news of late about the proposed bill HR 4437 that will limit the flow of illegal immigrants across the border from Mexico. Since 1942, when the guest worker program was begun, the Mexican brocero has been the backbone of the California and Oregon wine industry, providing a majority of the field labor. Although most workers toil as field hands with limited wages and benefits, there has been a concerted effort through various charity organizations to provide proper health care and living facilities for the migrant Mexican workers. A number of workers with the passion and skills to succeed in the wine industry have lived the American Dream and become prominent owners of vineyard management companies and even wineries. Reynaldo Robledo, the first former migrant vineyard worker in North America to own a winery, is a prime example. His story was profiled in a recent feature article in Saveur (October, 2006). Robledo came to the United States at age 16 with a few other relatives from the Mexican state of Michoacan in 1968. He initially lived in a migrant labor camp near Calistoga, working long hours pruning vines for as little as $1.10 an hour. After 35 years, he has his own vineyard management company with 30 to 45 year-round employees, as well as his Robledo Family Winery. He has 220 acres of vineyards (90 of them are leased) in Napa, Sonoma, and Lake counties. He sells grapes to several notable wineries, and makes 10,000 cases of his own wine. 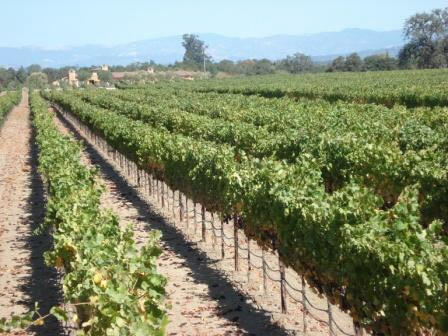 Robledo produces multiple varietals including Pinot Noir. His 2003 Pinot Noir ($28) won a gold medal at the 2006 Orange County Fair Wine Competition. Robledo’s entire family, including nine children, all work in the family business. The winemaker is Rolando Herrera, another Mexican-American who was formerly the director of winemaking for Paul Hobbs. The winery has a tasting room at 21901 Bonness Rd, Sonoma. The website is located at www.robledofamilywinery.com where wines may be purchased. The phone is 707-939-6903. Another Michoacan, Ulises Valdez, can trace a similar story. In 1985, at age 16, he crossed the border and traveled to Sonoma County to join his older brother who was working in the vineyards. Although underage, he was able to obtain a job pruning vines based on his skills (and by lying that he was 18). Like many migrant workers, he lived in humble conditions and rode a bicycle to the vineyards. He obtained amnesty in 1986 and achieved citizenship in 1996. Valdez became a partner in Florence Vineyard Management Company, and in 2003, he bought Jack Florence, Jr’s stake in the company and named it Valdez & Sons Vineyard Management, Inc. His grape clients include many prominent names such as Paul Hobbs, Mark Aubert, Kent Rosenbaum, and Jayson Pahlmeyer. Valdez now controls 150 acres of vineyard land in Sonoma County and has 70 employees. His Pinot Noir vineyards include the Ulises Valdez (UV) Vineyard (aka Laguna Road Vineyard) near Sebastopol in the Sonoma Coast appellation and the Lancel Creek Vineyard in the Russian River Valley. In 2006, he started Valdez Family Wines, marking 20 years in the wine business. He has made a 2004 Ulises Valdez Vineyard Sonoma Coast Pinot Noir and next year will release the 2005 Valdez Family Wines Lancel Creek Pinot Noir ($80, 25 cases), both of which were made by Mark Aubert. Aubert gives considerable credit for his own success to Valdez, who is his vineyard manager and viticultural partner. 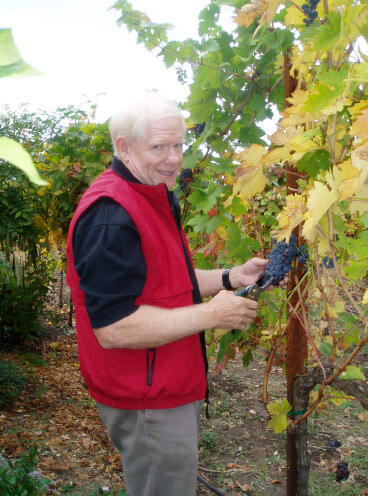 Aubert sources his own Pinot Noir from the UV Vineyard. Young winemaker, Jamie Kutch, will be releasing a 2006 Kutch McDougall Vineyard Pinot Noir in the future from a vineyard that Valdez farms next to Hirsch and Martinelli Vineyards on the Sonoma Coast. Valdez’s website is located at www.valdezfamilywinery.com, where you may purchase wines (no Pinot for sale yet) and sign up for the mailing list. 707-894-3710. There are now at least 12 Mexican-American-owned wineries in California, including Ceja Vineyards, Gustavo Thrace, Alex Sotelo Cellars, Mi Sueno, Renteria Wines, and Guerrero Fernandez among others. Arturo and daughter Ana Keller are Mexicans (as opposed to Mexican-Americans) who own Keller Estate in Petaluma, a fine producer of Pinot Noir. For more information on Latino-owned wineries, contact Sandra Gonzalez of Vino con Vida communications at www.vinoconvida.com. I have been curious for some time about the variability of different barrels of Pinot Noir within a winery’s cellar. It is well-known that wine produced from the same vineyard and vinified in the exact same manner, will vary in aromatic and flavor profile from barrel to barrel. This is why “barrel tasting” can be misleading to the consumer and critic, because the winemaker will usually offer samples from the best tasting barrels. Often the very best barrels in the winery’s cellar will be bottled as a reserve. Recently I posed the question to Ed Kurtzman of Freeman Cellars and August West. He offered the first clear explanation for me. He said that each oak barrel was distinctive and different, even barrels made from the same tree on the same day. Each oak tree, as well as each part of the tree will produce staves that have subtle differences in flavor which are then passed on to the wine in barrel Ed, like most winemakers, actually prefers this variability for it adds interest to the finished wine. Xoomers (pronounced Zoomers) are Gen X Men, ages 25-39 and they are posed to become a powerful wine drinking and wine buying segment of the population. In a study by GQ magazine, they have become savvy brand name shoppers and inclined to spend freely on luxury products such as wine. The study found that Xoomers outspend Baby Boomers by 19%, are 15% more likely than Boomers to pay a premium for luxury goods, and 68% more likely than Boomers to increase luxury spending over the next ten years. They are 31% more likely than Boomers to pay a premium for beer, wine and liquor. The Xoomers are far more likely to try new products and items that are stylish, while the Boomers are downsizing their lives, looking to buy based on value. Xoomers are 37% more likely than Boomers to spend a majority of discretionary income on themselves. Even younger consumers, the so-called Millennials, young adults 26 years of age and younger, are spurring on the rising consumption of wine. The United States Market Council reported that there are even more core wine drinkers among Millenials than Gen X and they are more likely to say they like the taste of wine and associate wine with fun times. Robert Smiley, director of wine studies at the UC Davis graduate school of management, did a survey of winery executives that indicated the health of the wine industry was in part due to the growing consumption of wine by young adults. The young consumer helped wine leap over beer as the most popular drink in the United States last year. Kendall-Jackson has created a separate unit, White Rocket, directed at marketing wines to millennials. It will incorporate current labels, Camelot, Dog House and Tin Roof and several new brands made from grapes sourced from several regions in California. Wine X Magazine was created several years ago in California specifically for the Xoomer wine drinker. It has been quite successful and I recommend you read it for its humor and irreverent style that actual appeals to all ages. An article relative to this discussion is good reading: “The Autobiography of Wine X,” by Darryl Roberts (Nov., 2003 at www.winexmagazine.com).